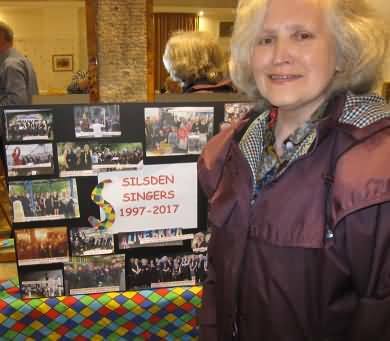 Silsden Singers is a friendly choir, and with Janet, we have enjoyed reviving Community Singing for the 21st Century in Silsden. Most of our songs come from Folk Traditions around the world, including the British Isles. We also sing songs by singer songwriters, and some light-hearted poplular songs from the last 50 or 60 years. We sing songs that celebrate the seasons, including some lovely ancient carols, both sacred and secular. Our wide-ranging repertoire also includes lullabies, songs celebrating love, work and peace, shape-note songs and songs of historical interest. Silsden Singers is an unaccompanied (a capella) choir. To date, we have only sung one accompanied song – 'Is This The Way to Amarillo'. We were accompanied by Silsden Town Band – it was a marvellous experience! Silsden Singers mostly sing in harmony, with some songs sung in three parts (High, Medium and Low), and others with Soprano, Alto, Tenor and Bass parts. Sometimes we sing in rounds or even rounds and harmony at the same time. Members of Silsden Singers can generally choose to sing any of the parts in a particular song; the exception being when a song does not really lend itself to such a treatment. Not many choirs enjoy this kind of mixed-part singing (men and women singing together in a part – usually an octave apart). However, it is a distinctive feature of the Silsden Singers 'sound'. It's sort of nice and rich! Currently, not many men sing soprano or alto very often, but women regularly sing in both Tenor and Bass parts. We could do with more men in the choir, and if you wanted to sing the tunes of the songs (that is, usually the Top or Soprano part), or sing the Alto part, you can if you're in Silsden Singers! Songs are taught "by ear", so members don't need to be able to read music. Musical notation is provided for those who like to see it written down. Sadly Carolyn Williams, our retired GP, deputy conductor and holiday choir leader for Silsden Singers died from cancer on 21st December 2018. Carolyn was a woman of many parts. She worked as a Samaritan, organised fundraisers for Manorlands Hospice, ran a little choir there herself, and was heavily involved in a community shop where she lived near East Morton and Riddlesden. Silsden Singers sang at a service of celebration for Carolyn on Friday 18th January 2019 at the Victoria Hall in Keighley. There were around 600 people who came to pay their respects and share memories, anecdotes, songs and music to mark this special day organised by her family to celebrate Carolyn's life. Carolyn was a founder member of Silsden Singers and actively supported and encouraged all past and present members. As a committee member she was proactive in the organisation of our choir and always found time to take on various responsibilities with commitment and enthusiasm. She will be greatly missed by us all.